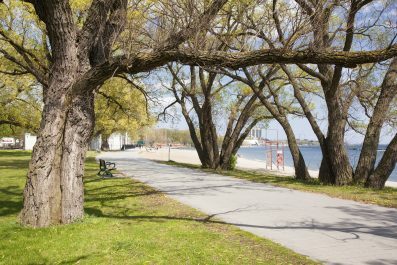 Connecting the beating heart of downtown to the serene shores of Lake Ontario, the Waterfront Trail has something for both nature lovers and cosmopolitan city dwellers. Taking in spectacular views of the CN Tower, the Toronto Islands, historical Fort York and numerous other attractions, this section of the Trail is ideal for urban adventurers – including people with limited mobility. Discover the sights and sounds of Canada’s largest city with this one-day experience, created to honour the Enterprise Mobility Fund. Begin your journey at the TCT Pavilion in Sir Casimir Gzowksi Park and head east. This beautiful green space takes its name from the 19th-century engineer who pioneered the development of railways across the country. Today, this park is a haven for both Torontonians and visitors, as well as their dogs! The park is in the centre of the district of Sunnyside, traditionally known as ‘The Playground by the Lake’ since the Roaring Twenties. The heyday can still be experienced at the Sunnyside Pavilion, a masterpiece of Art Deco architecture that can still be found on Sunnyside Beach. Take a moment to admire the view, and take a few photos! Feeling hungry? Grab a lakeside table at the Sunnyside Café for some hearty pub grub, or coffee and cake. After your lunch, continue east along the Trail, passing the Palais Royale Banquet Hall and the Argonaut Yacht Club. En route, you’ll walk through Toronto Inukshuk Park, a green space that pays homage to Canada’s Indigenous roots. The 30-foot Toronto Inukshuk is a legacy project of World Youth Day 2002, and is inspired by sculptures sometimes found in Arctic landscapes. Inukshuks are believed to provide guidance to travellers on land and sea. There’s even more for culture enthusiasts further east! 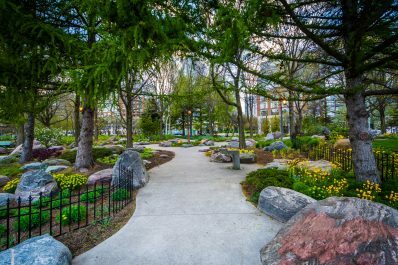 Take a stroll in the Toronto Music Garden, which was conceptualized by world-famous cellist Yo-Yo Ma and landscape designer Julie Moir Messervy in 1999. The garden represents six movements of Bach’s ‘Suite No. 1 in G Major for Unaccompanied Cello’ with intricate flower arrangements and sound installations. Guided tours are available throughout the summer. Now that you’re in Toronto’s Harbourfront Centre, take some time to savour up the lively atmosphere and see how far you’ve come. As you pause, a snapshot of the CN Tower and its surroundings is a must! If you’re not ready to finish your Trail adventure yet, don’t worry! Follow the Trail to the Jack Layton Ferry Terminal between Bay Street and Yonge Street and take a short boat ride to Centre Island, which offers numerous facilities and a stunning view of Toronto’s iconic skyline. Beach wheelchairs are available at no charge from the First Aid Station at the beach on Centre Island on a first-come, first-served basis, for a maximum of two hours per visit. Created through a generous gift from the Enterprise Rent-A-Car Foundation, the Enterprise Mobility Fund is TCT’s first fund to increase the number of accessible sections on The Great Trail. WheelchairTravelling.com have numerous suggestions for comfortable accommodations that offer partially or fully accessible facilities.